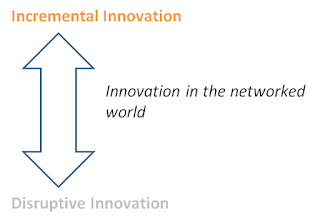 Somebody once asked a mystic of the networked world, "What is Innovation?". Laughing heartily, he quipped, “Innovation is like a joke! It is like a fish in the ocean searching for the ocean". He then narrated a story. 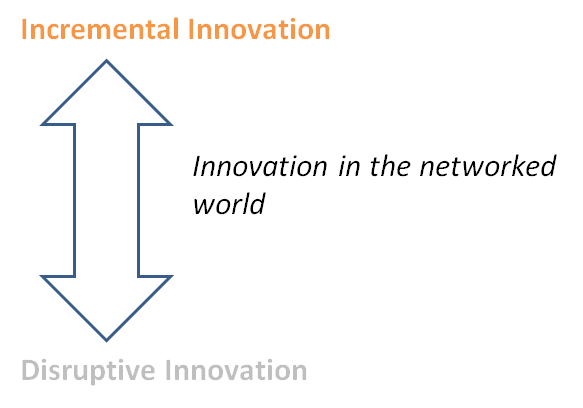 When I look at innovation today, I often wonder, how could we talk about networked age and in the same breath, talk about innovation in the traditional way. Check out what people are talking about with #innovation. More often, you would come across these words: radical, disruptive, game-changing,challenging the status-quo. Even while we are talking about Open Innovation, Crowd sourcing and other models gaining strong currency to foster innovation in the networked world, most of us, try and put some of our familiar vocabulary, old ways of description into the new world. While there has been several definitions and interpretations and for this word, I define innovation, for the purpose of discussion, in broad terms, as "significant positive change"
Thomas Kuhn in his seminal classic, The Structure of Scientific Revolutions, talks about "The Essential tension", which led to innovation through paradigm shifts. This further evolved into classifying Innovation broadly as Incremental Innovation and Disruptive innovation. Everybody wanted to be at the top end, Disruptive Innovation, of the spectrum. Innovation gurus and consultants advocated Disruptive innovation to their clients, as they feared large companies might be fraught with risk of getting caught unaware by new entrants. Incremental Innovation was considered uncool as it involved tinkering with the old which gave limited competitive advantage. Disruptive innovation was considered game-changing, as it involved disrupting business as usual. Central to this discussion about innovation in the previous era, is the importance of pre-requisites. Innovation was made possible only when companies had sufficient upfront access to capital and information. This implied that businesses had to fully conceptualize, structure and make the product ready before they could make profit out of it. No wonder products had long life cycles. It is high time we jettison our old definitions and redefine business once again. Simon Wardley provides an excellent definition of business in his blog. A business is a living thing, comprising a network of people, a mass of different activities, and reserves of capital including financial, physical, human and social. It consumes, it produces, it grows and it dies. Like all organisms, any business exists within a number of ecosystems in which it competes and co-operates with others; it's shaped by and shapes its environment, and hence needs to adapt constantly merely to survive. Business is increasingly following the principles of biology and not physics (Newtonian mechanistic model, to be precise, while, it definitely teeters around Quantum Physics, but that's another post sometime). As Greg Satell had pointed out recently, radical changes rarely works. Radical change works by changing the levers of business ecosystem. The hidden assumption here being, it is possible to shape the industry conditions in a static business environment. As businesses get further networked, the ecosystems are becoming more complex every day. Incremental action alone can work, where business works around the edges, evolving continuously, in sync with the way the ecosystem evolves. With every incremental innovation, infinite starting points open up, creating further exciting possibilities to extend the business. While each incremental innovation has the potential to become disruptive, the critical difference being, it manifests, not based on firm's decision, but only when the ecosystem necessitates them. How do you start innovating incrementally? Simple. Start with what you have. What's intrinsic to your business? Develop relationships around it. As you become more, you offer more. 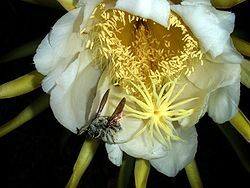 Have you ever wondered how pollination happens in nature? You have no clue where the bee will come from, which flower will it sit, out of that where the honey will go, which fruit will be created. Wait, Did I just share how innovation manifests in the networked world? **** Story adapted from Sri Sri Ravishankar's talk on "What is Enlightenment?" because of this networked world, (as mark zuckerberg said in the last web2.0 summit 2011) more and more businesses in future will be designed around people.since the incremental changes are easy on the pocket as well,(as jimmy wales said) more and more people will do businesses not for strategic reasons but because it's fun. Thank you Avinash for your comments! Yes. As it is fun, and the best part being, it is highly dynamic, very much NOW, as opposed to a well thought out plan! Hey Venkat, loved this one. There happened an interesting converstaion over twitter where a girl asked me about the job of a marketer. People still believe that, (if at all there is something called as marketing on this earth) marketer's job is confined to selling or making strategies so that people consume more and more. Innovation is still considered as a part of someone's Job Decription. Which essetially means, there are people in a business who are supposed to innovate and some, who don't have it in their JD, are not supposed to! This is funny! Moreover, the most sorry state of affairs it is the students (masters of some business administartion) of marketing who happen to misunderstand business; just because they are lost too much in the jargons of marketing. Nice thoughts..You are right..Actually I think we dont need to do anything..The whole business is moving away from jargons. Its actually worth pondering, would a job be defined by job description? While you may have been considerate about marketer's egos, it is worth exploring whether this ego manifests in the form of ridiculous jargons! In a way, good that you are making students especially rethink what marketing is about..Thanks for sharing this conversation! Would like you to write something on similar lines as a blogpost. :) Infact there are many heads in above two comments that can lead to several blogposts. That's true. Let me see how it emerges out! Enjoyed this- we still do not have the 21st structures thought through. Have we seen the ocean? The problem is we are 'bobbing up and down in it' and not sure where it is taking us, we are rudderless. Yet we are drifting along, one incremental step after another. The problem becomes one of incrementing on something that is not in the first place right- constant consumption. @twitter-26716467:disqus You've nailed the moot point here. We need to learn surfing here..moving with the waves, not against them. With them - so much so, that you are not different from them. This demands companies to be nimble. Otherwise we are drowned...Thanks for dropping by Paul and sharing your thoughts. I really appreciate it. thanks chetan..to be more innovative, i doubt if it can be purely individual based though..to bring the metaphor of the network, each of them are strong nodes in the network..each node is equally important.. Loved the ocean metaphor. The 'science & art of innovation' will always involve trying to perceive our 'ocean' in different ways. We'll find new ways of perceiving and living in the ocean. Will we ever find the 'best ever' way? Never. We'll have to wait for it forever, I guess. That's the beauty about what we all do. We're constantly exploring. Thanks Ranjan for your thoughtful comment! Indeed, we are constantly exploring!